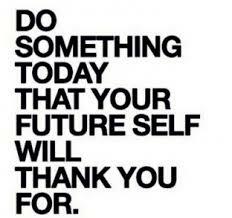 The National Career Fair is always an event that is worth the time of anyone who cares to be in attendance. 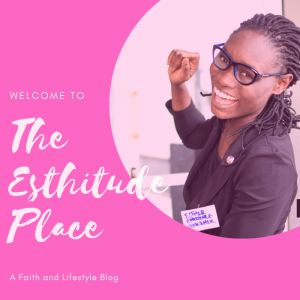 Towards the end of the year, when everyone is warming up towards 2018, organizations are “balancing their accounts” and seeing if they’ve made profit all through the year, individuals are writing down goals and resolutions in preparation for next year and personally, I’ve decided to attend events; empowering and enlightening events. I want to gather knowledge and connect with great minds so that come 2018 I’ll do wonders. I wasn’t ready to attend this program. In fact, I had zeroed it from my mind that I will not be attending. Then, I received a call from a friend whom I invited for the program, telling me she’s at the venue already. That was it! I stood up from my bed, I already had my bath before then so I just prepared and went for the program. The National Career Fair is an annual program that has been held for five years and this is the sixth year. It holds in six different states in Nigeria; Lagos, Abuja, Oyo, Kaduna, Akwa-Ibom. This year, it was themed The Bold Move : Think. Create. Job. 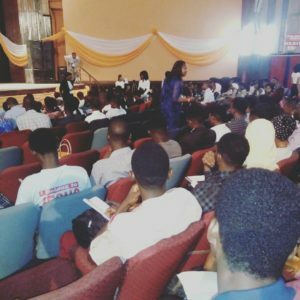 It was held at the University of Lagos Main Auditorium and the aim of the program was to reach out to unemployed youths and undergraduates (who will eventually have to go into the market), to teach them the proper way to apply for their dream jobs or better still, to create their dream jobs. I arrived at the program late and so the program had already started. But I met a representative of the Jobberman/Stutern team educating the audience on Best Practices on CV writing, interviews, internships, and transition into the labour market. I met her discussing certification and skills, interests and hobbies, team work, organizing, commitment, intellectual etc; as things we should be equipped with as we apply for jobs. After her session, we were graced with the presence of Senator Babajide Ojudu. He successfully set fire in our hearts as he told us the story of his career in the field of journalism before he got into politics. 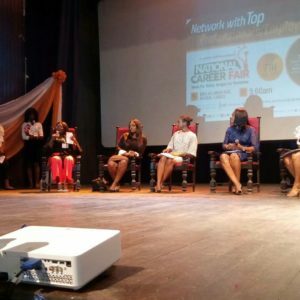 We had three panel sessions where great individuals like Shola Animashaun (CEO of SAPhotoAcademy), Ajayi Oluwatobi (CEO of Jetvan Automobiles Ltd.), Mrs. Adetoro Suleiman (MD of Feminik Logistics), Marcus Owolabi (Founder of mycelebrityandi.com), Nelson Jack (CEO of Nelson Jack Ent.) and Elenu the Comedian; for the first panel. The second panel was graced with great minds like; Mr. Abisoye Fagade (CEO of Sodium Brand Solution), Mr. Salem Adegunwa (MD of Rite Foods Limited), Chief Shina Peller (CEO of Aquila Group), Jacqueline Aki (CEO of James Cubitt Interiors) Dapo Omolade (CEO of Hybrid Group) and Dimeji Audu. The third panel which was also the last panel and my best was the women panel. It was graced with great women and everybody was at awe throughout the panels Q/A. 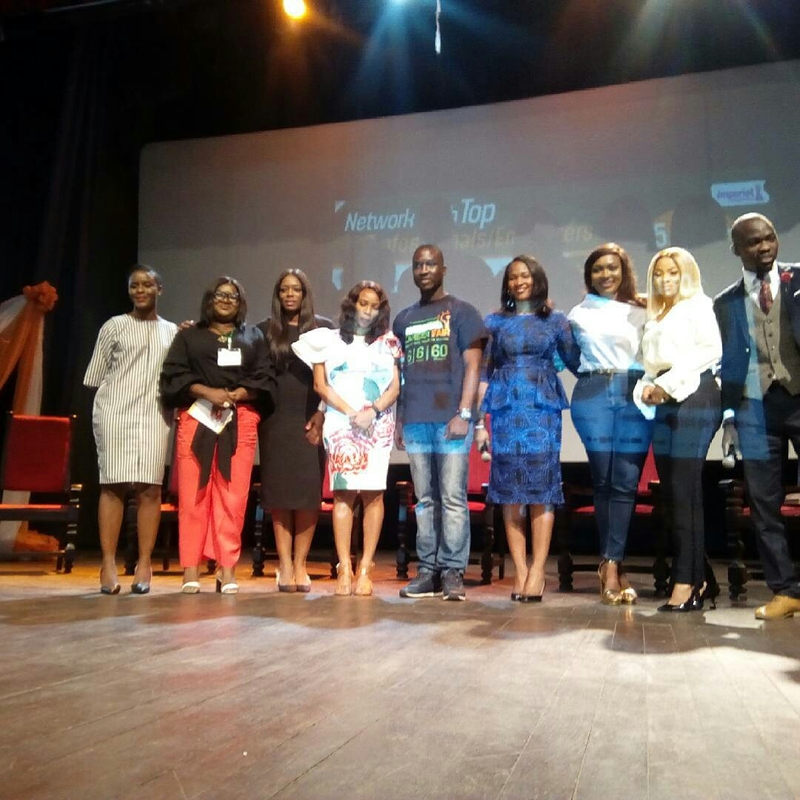 It had individuals like, Tosin Oshinowo (Lead Architect of cmDesign Atelier), Lily Aninyei (CEO of The GreenRoom Nigeria), Finale Omikunle (CEO of Teach for Nigeria), Mrs. Elohor Aisien (CEO of Beth Models), Raufu Aishat (CEO Aeesha Collections) and finally Toke Makinwa (Media Personality). All these great minds join together, each saying their stories, giving advice and offering jobs and internship opportunities. We couldn’t be any less blessed. Shola Animashaun, the great photographer, encouraged reading. In doing this he recommended books like Eat that frog and How to make friends and influence people. Also, we were able to understand that it is not sufficient enough to earn degrees. We have to do more than earning degrees to be whom we dream to be. Besides that, we were taught that we have to despise the shame that comes with growth and just keep growing. The event opened our eyes to the essence of internships and experience. And we were advised to apply for jobs and internships not regarding the monetary gain until we gain full experience. As the event rounded up, we also learnt to be very professional in whatever we do.